Abbé refractometer was the first refractometer to be offered commercially (see refractometer history for more details). It's original design was so successful that even as of today it is over 149 years old, it is still used and copied in new devices. Abbé refractometer working principle is based on critical angle. Sample is put between two prisms - measuring and illuminating. Light enters sample from the illuminating prism, gets refracted at critical angle at the bottom surface of measuring prism, and then the telescope is used to measure position of the border between bright and light areas. Telescope reverts the image, so the dark area is at the bottom, even if we expect it to be in the upper part of the field of view. Knowing the angle and refractive index of the measuring prism it is not difficult to calculate refractive index of the sample. Surface of the illuminating prism is matted, so that the light enters the sample at all possible angles, including those almost parallel to the surface. If you have seen our page on the critical angle refractometer, you already know that these rays are crucial for the working of the refractometer. Abbé type crtitical angle refractometer. 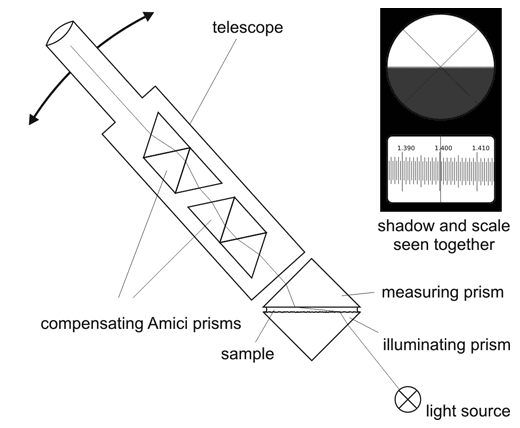 While the image above already explains the basic principle, it is not yet a complete desing of the Abbé refractometer. Refractive index of a substance is a function of a wavelength. If the light source is not monochromatic (and in simple devices it rarely is) light gets dispersed and shadow boundary is not well defined, instead of seeing sharp edge between white and black, you will see a blurred blue or red border. In most cases that means measurements are either very inaccurate or even impossible. To prevent dispersion Abbé added two compensating Amici prisms into his design. Not only telescope position can be changed to measure the angle, also position of Amici prisms can be adjusted, to correct the dispersion. In effect edge of the shadow is well defined and easy to locate. Original design made use of two telescopes - one was used to locate shadow boundary, the other to read the result. Modern devices combine both views so that you can read the result immediately, without a need for checking the other view. Some specialized devices may have double scale - one can be used for reading refractive index, the other (situated below or above, and visible at the same time) can be scaled in degrees Brix or concentration of some substance. Abbé refractometers come in many variants, that differ in details of their construction. In original design whole telescope was rotated around stationary sample and scale. In modern designs telescope position is fixed, what moves is an additional mirror between sample and telescope. Abbé refractometer can be used to measure both refractive index of liquids and solids. In both cases refractive index of the substance must be lower than the refractive index of the glass used to made measuring prism. 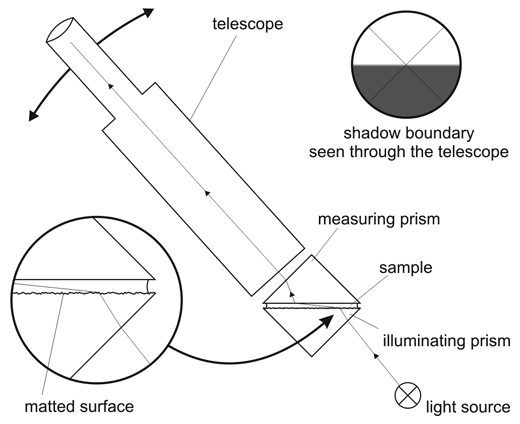 To use the refractometer we simply put the sample between illuminating and measuring prisms, use rotating knob to place the shadow boundary on the telescope cross hairs, and read the refractive index from the scale. Liquid samples must be non corrosive, to not damage surface of the prisms. Abbé refractometers can give an accuracy of about one to two units in the fourth decimal place. It is worth of noting here, that - as refractive index changes with temperature - for a correct result of refractive index measurement we have to either use thermostated sample, or - after measuring the refractive index - measure temperature and read correction from tables. Most laboratory models of Abbé refractometers are ready to be attached to the source of constant temperature water. While correct name of the device is Abbé refractometer, device is commonly named Abbe refractometer in books and by producers. This site is in construction. More to come. Page was last modified on March 16 2011, 23:59:48.